Of all the written works created during the Civil War, Mary Chesnut’s diary is one of the most well known. Because of her ability to frankly describe the events that transpired,her diary is considered by historians to be the most important work by a Confederate author, and a true work of art. Born to Congressman Stephen Decatur Miller and May Boykin on March 31, 1823 at Mount Pleasant plantation near Stateburg, South Carolina, Mary Miller was the eldest of four children. In 1829, her father became governor of South Carolina, and in 1831, he served as a U.S.senator. Mary was educated at home and in Camden schools before she was sent to a French boarding school in Charleston at age 12. She spent her school break at her father’s cotton plantations in Mississippi,but when he died in 1838, she returned to Camden.She met James Chesnut Jr., eight years her senior, in 1836, when he was at the boarding school visiting his niece, and although he began to court her, Mary’s parents opposed it. However, on April 23, 1840, when Mary was 17, the two were married. For the next twenty years,Mary spent her time between Camden and Mulberry, her husband’s family plantation. James was elected to the U.S.Senate in 1858, so Mary accompanied him to Washington, where she nurtured friendships with many upper-class citizens, including Jefferson and Varina Howell Davis,John Bell Hood, and Wade Hampton III. When talk of war escalated in 1860, James was the first to resign his senate seat on November 10, The Chesnuts returned to South Carolina, where he participated in drafting an ordinance of secession, and served on the Provisional Congress of the Confederate States of America.From February 1861 through July 1865, Mary recorded her experiences. She was in Charleston when Ft. Sumter was fired upon on Friday, April 12, 1861, and watched the skirmish from a rooftop. In her diary, she described the city’s residents, along with what is now known as The Battery, sitting on balconies and drinking salutes to the advent of hostilities. After the war, the Chesnut’s returned to Camden,struggling unsuccessfully to get out of debt. James had inherited two plantations when his father died in 1866: Mulberry and Sandy Field. They were heavily damaged by Federal troops, and slaves who had become freedmen still depended on him. James and Mary’s mother died within a week of each other in January 1885. According to his father’s will, the land was to be passed down to a male heir, and because he and Mary never had children, she lost her claim. Born on October 1, 1808, Mary Anna Randolph Custis was the only surviving child of Mary Lee Fitzhugh Custis and George Washington Parke Custis, who was George Washington’s step-grandson. Mary Anna was the great-granddaughter of Martha Washington. She enjoyed all the benefits of growing up in a wealthy family, and spent most of her time at Arlington, which her father built in honor of George Washington. Mary had many suitors, and received a marriage proposal from Sam Houston. The man who stole her heart, however, was her second cousin, Robert Edward Lee, whom she had known since childhood. They were married at Arlington on June 30. 1831. Robert had already become an established military man, so he brought Mary with him to West Point. It wasn’t long before she gave birth to a boy, and over the course of several years, bore two more sons and four daughters. She was fluent in four languages, and was an avid painter, author, and horticulturalist, propagating eleven rose varieties in her garden at Arlington. Mary was also deeply religious, and as her rheumatoid arthritis progressed, she accepted it as the will of God. She inherited Arlington after her father passed away in 1857, and two years later, published his memoirs, which she entitled “Recollections.” She included an editor’s note stressing the urgency of reconciliation between northern and southern states, as the approaching Civil War seemed imminent. Following Virginia’s secession, Mary’s sons enlisted, and Robert resigned from his position with the U.S. military to serve under the newly-formed Confederate States of America. He traveled to Richmond, but Mary remained at Arlington until May, when she received word that Union soldiers were crossing the Potomac from Washington to seize her estate. Reluctantly, she departed, believing that the move was only temporary. How strange she must have felt knowing that she, the descendant of George Washington, was now the enemy. She traveled to different family-owned plantations until the encroaching Yankees forced her to retreat to Richmond. Once there, she set up housekeeping at several locations, all the while diligently knitting socks and mittens for her husband and his soldiers, despite her crippling arthritis. In 1863, following the Battle of Brandy Station, Mary witnessed the arrest of her wounded son, Rooney, who had been transported to a local plantation home to recuperate under Mary’s care. She found it necessary to travel to hot springs because of her condition, where she learned of the battles at Gettysburg and Vicksburg. Once she returned to Richmond in the fall, she busied herself with knitting, even though inflated costs made it difficult for her to obtain yarn, and she was saddened by the loss of a daughter due to typhoid fever. Rooney’s two children and his frail wife also succumbed to disease. During the war, she rarely saw her husband or sons. While her daughters attended services at St. Paul’s Episcopal Church on April 2, 1865, they observed as President Davis was called away, and learned afterward that General Lee’s forces had fallen back: Richmond was being evacuated. Mary, however stubborn, refused to leave, and watched from her window as residents scrambled to get out before the Yankees invaded. Following a still quiet, bummers entered the city, looting, cursing, and setting fires. Still, Mary resiliently held tight. Union forces soon appeared, restoring order, and a sentry was placed at her door for protection. Out of the goodness of her heart, she sent down a breakfast tray every morning to the weary soldier who stood outside her door. It wasn’t long before she learned that her husband had surrendered his army. Robert, along with their sons, returned home soon afterward. Once the war ended, Robert received many job offers, finally accepting the position as president of Washington College in Lexington. By December, Mary joined him. They spent many happy years together until the summer of 1870, when Robert caught a cold that aggravated the angina he’d developed seven years earlier. He died on October 12, and was buried in a crypt beneath the campus chapel. Mary did not attend the funeral. Bedridden for a month, her health finally improved. She was allowed to remain at what was renamed Washington and Lee College, since her son, Custis, had been elected to succeed his father. In 1872, she filed a petition with the Judiciary Committee of Congress to receive payment for Arlington, but her request was denied. Meanwhile, her arthritis had grown so bad that she could no longer sew, so she painted and sold tinted photographs of herself, Robert, and George and Martha Washington, donating the proceeds to charity. The following year, she toured Virginia, where her travels brought her back to her beloved Arlington. Appalled by the desecration, she remained in the carriage as old servants ran out to greet her. Grand trees that had once stood on the property had been reduced to stumps, and headstones cluttered the lawn. She returned to Alexandria, and continued her charity work. In October, her daughter, Agnes, died, which broke Mary’s heart. The loss was too much for her: on November 5, 1873, she, too, passed away. Per her request, she was entombed in the basement of the college chapel next to her husband. 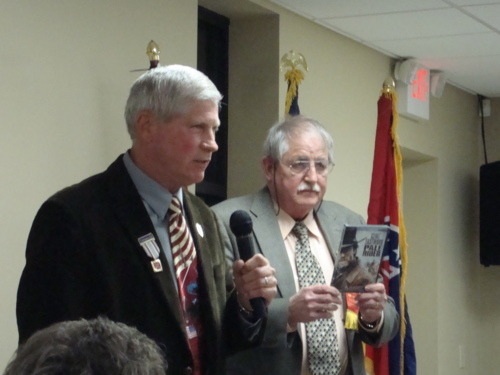 Last Saturday night, the Sons of Confederate Veterans Samuel A. Hughey Camp 1452 celebrated Generals Lee and Jackson’s birthdays with its 24th annual dinner honoring the occasion. A good-sized crowd turned out to honor the two Confederate generals, including members of the Varina Howell Davis Chapter 2559 United Daughters of the Confederacy. The participants enjoyed a splendid dinner prepared by Linda McCan who, in this writer’s opinion, should start her own catering business! Following dinner, the Honorable Al Canon gave a talk about the two celebrated generals. 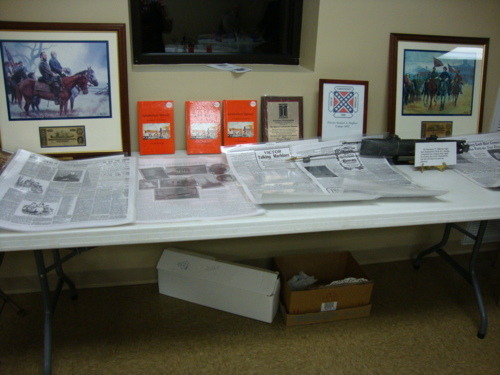 The gathering participated in an auction to help raise money for a proposed Mississippi monument that the camp would like to have erected at Shiloh National Military Park in Tennessee. 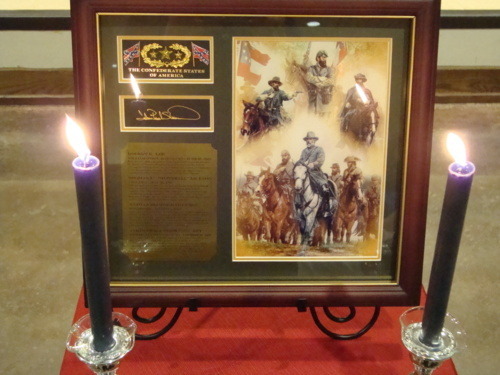 Following the auction, a candlelight vigil was held honoring the two generals, as well as each member’s ancestor, who was called out by name. The annual dinner was a great experience for all. This week marks birthday anniversaries for two of the Confederacy’s greatest generals, Robert E. Lee and Thomas “Stonewall” Jackson. Today is Lee’s birthday (Jan. 19) and Saturday is Jackson’s (Jan. 21). In honor of these magnificent men, celebrations around the country are being held in their honor. Such is the case with my own UDC chapter. The Varina Howell Davis #2559 held a Lee-Jackson tea earlier this week. 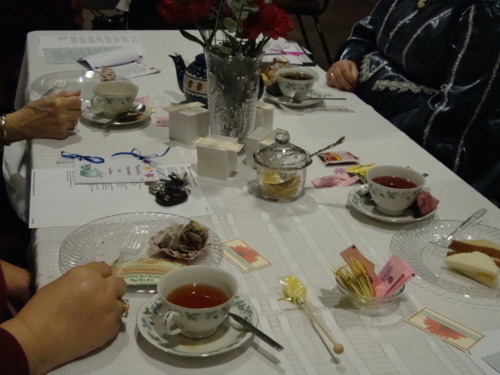 We learned how to display proper etiquette while enjoying a 19th Century tea, such as what order to eat the delectable treats, which side of the cup saucer we are supposed to lie the spoon on, etc. Interesting stuff, but I wouldn’t want to have to live with so much regimented protocol every day! Women during the Civil War used teas as a way to socialize, and because they were very formal events, ladies used the opportunity to dress in their finest attire. 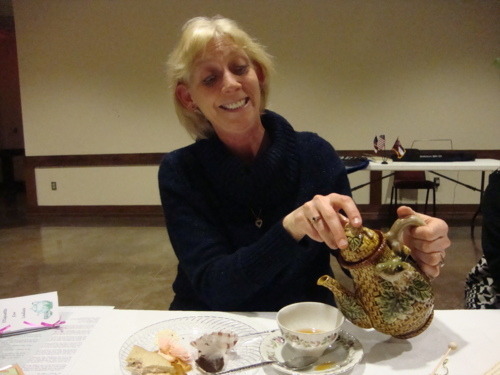 We used the occasion to honor our heroes, enjoy each others company, and try some delicious teas and tidbits. I recently posted several blogs about the infamous CSS Hunley, the first submarine to sink an enemy warship. The sub was used by the Confederacy during the Civil War, but sadly, as soon as it completed its successful mission, it sank, and remained at the bottom of Charleston Harbor for over 100 years. Thanks to author Clive Cussler and a team of researchers, the Hunley was discovered in a bed of silt. After bringing the vessel back up to the surface and transporting it to a holding facility, the remains of the Confederate crewmen inside were laid to rest in 2004 during a military ceremony. Last Thursday, the world got its first unobstructed view of the Hunley since the Civil War. It took 12 years, from the time it was discovered until now, to get to this point. Hopefully, the vessel will be put on public display soon. 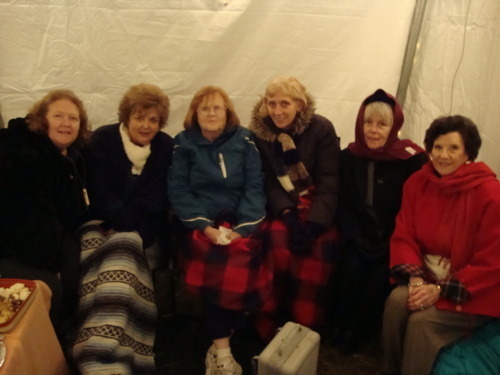 Over the holidays, the local chapters of the United Daughters of the Confederacy and the Sons of Confederate Veterans braved the cold to host Southaven, Mississippi’s annual event known as Southern Lights. This wonderful light display is held in City Park and takes about 20 minutes to drive through. Every year, a few more displays are added. My favorites are the dancing Christmas trees (to “Carol of the Bells” by Trans-Siberian Orchestra) and the Peanuts display, performing, of course, to Shroeder’s piano song. Both consecutive nights were cold and clear. 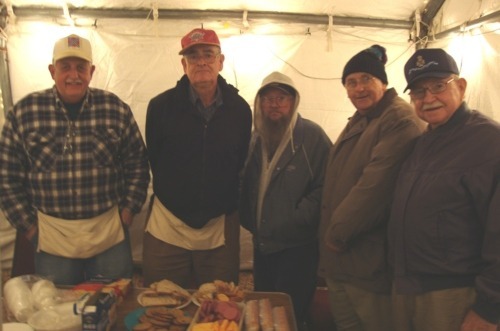 Plenty of comradery, hot chocolate, and treats kept the volunteers busy as they tried to stay warm inside the small heated shelter, taking turns to wait on customers. 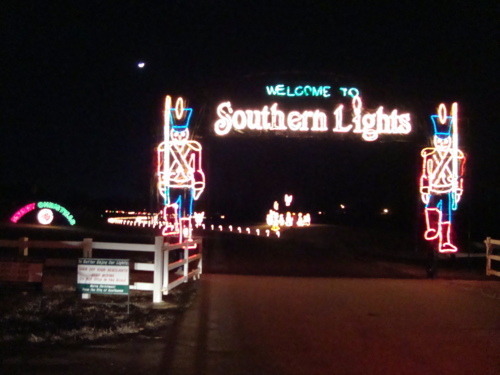 The great thing about Southern Lights is that Southaven divies up the admission equally between all nonprofits who collect money from cars and buses that enter the display. It is one of the biggest fund-raisers that the UDC and SCV members have, and this year’s event was very benificial to both groups. Plus, it was a lot of fun! One hundred and fifty-one years ago, Mississippi’s state legislature voted to secede from the Union. It was the second state to do so, following South Carolina, which seceded on December 20, 1860. The Mississippi Secession Ordinance was written by Lucius Quintus Cincinnatus Lamar III, a congressman who resigned earlier in the month. State Senator Jefferson Davis also resigned his commission on January 21, 1861, and would later be elected president of the Confederate States of America. In remembrance of this momentous occasion, compatriots are asked to fly their Bonnie Blues and/or Mississippi State Flags in honor and remembrance. “Mississippi Secession Day” is celebrated every year on January 9, but since this is the sesquicentennial observance of the War Between the States, the gesture is more significant. Certain parties would consider this observance to be obsolete, irrelevant, or politically incorrect. That is, until they check into their ancestry and discover their Confederate heritage. It’s easy to forget what our relatives lived through. It’s tougher to imagine what their lives were like, and it’s a big challenge to rise up and resist ignorance and misinformation about our Civil War. For those of us strong enough to persist and protest, it is our obligation to inform, instruct, honor, and NEVER forget. A recent hearing by the townspeople in Lexington, Virgina voted to abolish flying the Confederate battle flag (i.e. the Southern Cross or St. Andrews Cross) because it offended some people. The town is famous for its Civil War ties, in that both Stonewall Jackson and Robert E. Lee are buried there. In fact, General Lee served as president of Washington and Lee University after the war. In contradiction, one speaker, H.K. Edgerton, an NAACP former president, spoke on behalf of allowing the flag to remain, stating that it dishonored black Confederate soldiers not to do so. The majority of people attending the hearing voted in favor of retaining the flag, but their opposition was overruled, and the ordinance was passed anyway. Members of the Sons of Confederate Veterans showed up in force to oppose the ordinance, and held a rally at a nearby park in protest, providing the crowd with free hot dogs and bluegrass music. After the 4-1 decision was passed by city officials, the SCV vowed to protest the ordinance. Belle Boyd was only seventeen years old when she began her illustrious career as a Confederate spy. She quickly learned the art of espionage after her hometown of Martinsburg, Virginia became overrun with Yankees. Born on May 4, 1844, Isabella Maria Boyd was the eldest child of Mary and Benjamin, who ran a general store and managed a tobacco plantation. Belle grew up with several brothers and sisters, dominating them all with her tomboyish ways. She attended Mount Washington Female College in Baltimore at age twelve and completed her education four years later, enjoying the life of a fun-loving debutante. Described as having shining blue eyes, thick light brown hair, and a fine figure, she made up for her lack of radiating beauty by being overly feminine, flirtatious, and dramatic. A brilliant talker, she dressed colorfully and wore feathers in her hats. Three years later, upon the onset of the Civil War, her father enlisted with the Virginia Cavalry, Stonewall Jackson Brigade. It wasn’t long before Belle was confronted with the enemy. On July 2, 1861, Union troops skirmished at nearby Falling Waters, and occupied Martinsburg on July 4. After indulging in confiscated alcohol, a band of drunken Union soldiers stormed into Belle’s home, tore down the Confederate flag that the Boyd Family proudly flew over their home, and attempted to hoist up the Stars and Stripes. Belle’s mother protested, and was attacked by one of the Yankees. In retaliation, Belle shot him, explaining it as follows: … “we ladies are obliged to go armed in order to protect ourselves as best we might from insult and outrage.” She was soon acquitted without reprisal for her action. “The commanding officer,” she wrote, “inquired into all the circumstances with strict impartiality, and finally said I had ‘done perfectly right’.” Her home, however, was constantly guarded by sentries afterward to keep an eye on her activities. She soon became a courier for Generals Beauregard and Jackson, carrying information, confiscating weapons, and delivering medical supplies. By early 1862, she had developed a reputation for herself, dubbed in the press as “La Belle Rebelle,” the “Siren of the Shenandoah,” the “Rebel Joan of Arc,” and the “Amazon of Secessia.” Using her feminine qualities to allure unsuspecting Yankees, she befriended the invading soldiers to obtain information for the Confederacy. One evening in mid-May, she eavesdropped through a peephole on a Council of War while visiting relatives in Front Royal, whose home was being used for a Union headquarters. With the information she obtained, she rode fifteen miles to inform General Stonewall Jackson. On May 23, she ran out onto the battlefield to inform General Jackson of last minute information. She later wrote that “the Federal pickets … immediately fired upon me…my escape was most providential…rifle-balls flew thick and fast about me … son near my feet as to throw dust in my eyes…numerous bullets whistled by my ears, several actually pierced different parts of my clothing.” Jackson captured the town and later acknowledged her bravery in a personal note. She was subsequently awarded the Confederate Medal of Honor. Belle was arrested on July 29, 1862 and incarcerated at Old Federal Prison in Washington D.C., but was released a month later as part of a prisoner exchange. She was arrested again in July 1863. Not a model inmate, Belle waved the Confederate flag from her window, loudly sang “Dixie,” and sent information to a contact person outside who shot a rubber ball into her cell. She then sewed messages inside and sent it back. She was released in December, but was arrested again in 1864, and this time was released for health reasons (typhoid fever). On May 8, she was sent to England as a diplomatic courier, but was captured while aboard a blockade runner, The Greyhound. She escaped to Canada with the assistance of Union naval officer Lieutenant Sam Hardinge, and the two traveled to England, where Belle went to work for the Confederate Secret Service. Hardinge was court-martialed and disgraced for his actions. The two were married on August 24. She married John Swainston Hammond, an Englishman who had fought for the Union army, in 1869, but sixteen years and four children later, divorced him. Two months later, in January 1885, she married Nathaniel High, Jr., who was an actor seventeen years younger than she. Sadly, Belle found herself stricken by poverty. She died of a heart attack while on tour in Kilbourn (now Wisconsin Dells), Wisconsin, and is buried there in Spring Grove Cemetery.